How do Hoseless Air Conditioners Work? Home  Portable Air Conditioners: Vent Free  How do Hoseless Air Conditioners Work? If you've ever wondered how hoseless air conditioners work if AC needs to vent hot air out of the room, here is a cooling solution that works without a hose! While all refrigerant-based air conditioning devices actually do need to vent the hot air they produce to the outside, some portable coolers can work without a vent hose at all. Let's look at what they are and how they work. First of all, this might seem like a trick answer. 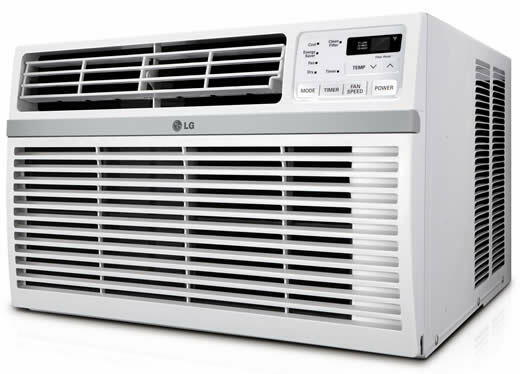 But in actual fact, window air conditioners are about the only kind of refrigerant-based AC that will work without needing a fixed duct or vent hose of some kind. These machines can work in all climates and come in a range of power output ratings. They can cool down most room sizes from a small bedroom up to a decent size living room. The only major drawback with window units is they take away a big part of the window opening itself. That restricts the amount of natural daylight coming into the room. Depending on where you live, for example a rented apartment, there may be restrictions on installing one of these. You'll need to check with the landlord first before going ahead and buying one. However, if it's OK to fit one and you don't mind losing a little natural light to compensate for being comfortably cool in summer, this is your answer! There is no need for complex installation, no duct work is necessary and when they're installed, they do a great job of keeping you cool. How did you guess I'd get on to these beautiful evaporative coolers in this article? Of course I would, since it's the main focus of the site! A swamp cooler can go by many names and is even called a ventless or hoseless portable air conditioner, no vent hose needed (even though these things are not AC at all). Many hardware stores and online vendors advertise swamp coolers by slipping in the words "air conditioner" to make people think they're getting something they're not. I've explained how these evaporative coolers work and how great they are and how cheap they are to run in other articles on this site already. So I don't want to go repeating the same old same old here again. Suffice it to say, if you live in a dry climate, hate wasting energy and money to pay for it, this is the cooling solution for you! I guess I should answer the question the title of this article posed. The two forms of cooler that work without a venting hose are pointed out above. So let's get to it. A window AC fits directly into the window space. The inside face puts out the cold air to cool the room. Inside the unit, the refrigeration process produce the cold air as well as hot air the needs to be exhausted and now allowed into the room. The outside face of the unit is, well, outside and that's where the hot air is pumped out from. Simple! A swamp cooler doesn't have a refrigeration process inside it. There's just a fan, a water tank and a wet medium to evaporate moisture and produce cold air. So it doesn't produce any hot air. No hot air = no need for a vent. Simple! That's how the two types of cooler work without needing a vent hose or ducting. Note: All portable air conditioner units must vent their hot air to the outside. They do that through the flexible hose that comes with the unit. You need to fix it to a window or purpose-built through-wall vent hole.